Soak cedar planks for 6 hours. Place trout fillet skin down on the cedar plank and season. Combine the mustard, syrup and oil together and brush generously over the trout. Place the plank with the trout either on your BBQ over an unlit burner with the other burners on high, or in the oven under the broiler on low (only do this if you have a hood fan to take smoke out of your house!). 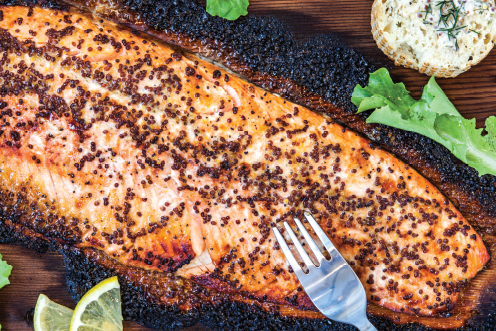 The trout should be ready in 18-20 minutes, serve directly from the plank and enjoy!